WHO: Michael Brown, the disgraced head of FEMA during Hurricane Katrina WHAT: The real story of how and why this hopelessly unqualified individual was placed in this sensitive post WHY: A web of self-interest, undergirded by a philosophical contempt for government and the governed. This article was originally assigned, accepted, and paid for in full by Vanity Fair — which never got around to publishing it, and graciously released it to the author. It tells the story of the cronyism, corruption, ineptness, contempt for the public and utter shamelessness of the Bush family apparatus and its extensive network. With yet another Bush now contesting the White House, and with the 10th anniversary of Hurricane Katrina upon us, we would do well to study this closely. It documents unequivocally how greed and self-interest in high places can tear apart the very fabric of American society. 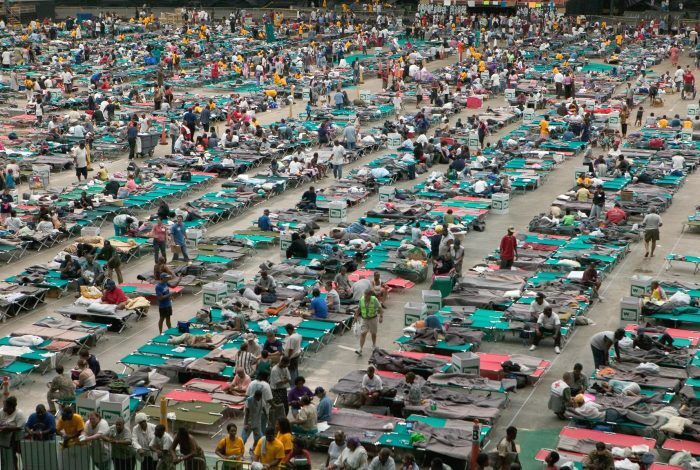 Originally written within months of Hurricane Katrina, it will still make your blood boil. This week we publish it in five parts. It has been slightly updated from the original. Days after Louisiana’s Governor Kathleen Blanco declared a state of emergency and the National Hurricane Center warned the White House that Hurricane Katrina could top the New Orleans levee system, the only FEMA official actually in the city itself — Marty J. Bahamonde — was not even supposed to be there. He had been sent in advance of the storm and was ordered to leave as it bore down, but could not because of the clogged roads. Michael Brown, the head of FEMA (the Federal Emergency Management Agency), was known to have made it as far as Baton Rouge but seemed out of reach. A week later, Brown would be replaced as on-site manager of the disaster. Blamed for his role in one of the largest domestic debacles in American history, Brown was still thinking of his own comfort: “I’m going to go home and walk my dog and hug my wife, and maybe get a good Mexican meal and a stiff margarita and a full night’s sleep,” he told the AP. In the midst of America’s worst natural — and manmade — disaster, it became clear that Brown was indeed lost in Margaritaville. Katrina showed that much of the Bush-appointed federal leadership was every bit as unqualified as Brown. Each new crisis seemed to expose still more cronyism, patronage and nepotism at the very top of the country’s leading agencies: a Medicare administrator who came from the hospital association and stayed just long enough to do its bidding; judicial nominees without appropriate experience; dubious appointments to agencies touching everything from mine safety to immigration and customs. The list of shame goes on and on. We still do not know the true extent to which the government was filled with Michael Browns. This is in part because of the media. At one time, major news organizations had a reporter assigned to each large federal bureaucracy, making it harder to sail these appointments through, and harder to hide incompetence and malfeasance. Now it takes a disaster to expose these things — when it is too late. But Michael Brown will forever remain the poster child for federal incompetence — and worse. So a central question remains: Who is Michael Brown, and how did he end up at the helm of the Federal Emergency Management Agency? Indeed, how did he and his predecessor and mentor, Joe Allbaugh, a Bush political operative, manage to turn FEMA, a once proud and effective disaster-relief agency, into a national disaster? On any level, it makes absolutely no sense that Michael Brown should have been holding any major government post. He had been a failed lawyer whose previous job ostensibly consisted of scrutinizing the ethics of judges in Arabian Horse competitions. In his highest pre-FEMA governmental job, he had been the quintessential neophyte: assistant to a city manager in a small Oklahoma city — and that had been decades before he came to Washington. “Brownie” lacked any of the other usual connections or qualifications one might expect to see in such an appointee. He had done no known political work for George W. Bush — a typical path to patronage jobs. He had no real background in emergency or logistics work of any kind. He was not a major donor. He was not even among the untold number of Bush family associates, allies, and friends. The only answer the public has ever gotten as to why Michael Brown headed FEMA is peculiar and highly dissatisfying: Joe Allbaugh wanted him there. 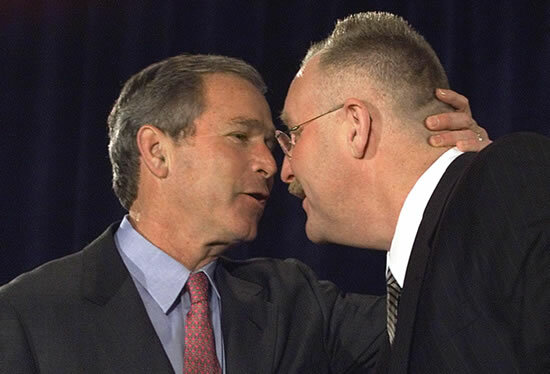 George W. Bush and his buddy Joe Allbaugh managed to turn FEMA, a once proud and effective agency, into a national laughingstock. Allbaugh is the brash and powerful but little-known Bush confidant who preceded Brown as FEMA director. When Allbaugh came to Washington, he brought Brown with him and rapidly promoted him until Brown was positioned to take over the agency. But why Michael Brown? When pressed, the taciturn Allbaugh tersely replied that Brown was a lifelong friend in whom he had confidence. To this moment, that has remained the official, indeed only, explanation of how and why Michael Brown was running FEMA when Hurricane Katrina struck. But a thorough investigation, encompassing scores of interviews and hundreds of documents, has uncovered another reality. It begins with this astonishing fact: Nearly all of Joe Allbaugh’s friends and acquaintances say they had never heard of Michael Brown, never met him, never even seen the two men in each other’s presence. To them, Brown was a complete stranger. The truth, as we have learned, is that the relationship between the two men had been hidden. The secret, decades-long partnership was designed to advance both men’s business and personal interests. By all appearances, that explains why Allbaugh asked Bush to let him run FEMA, and why he then turned the place over to Brown. Indeed, as soon as Allbaugh left the agency, he began cashing in. FEMA after the Allbaugh-Brown era was staffed by people put into position by the two men, and run by David Paulison, best known for advising Americans to stock up on duct tape as protection against future terrorist attacks. Is this really just about incompetence? Or has a debilitating “culture of corruption” become deeply embedded in agencies like FEMA on which we literally rely for our lives? In a more perfect world, the media, Congress, and engaged citizens would have wanted to know a great deal about Joe Allbaugh and Michael Brown before they were confirmed to serve in important positions. Even just a hard look at Brown’s last job before FEMA would have set off alarms. For a decade, Brown was Commissioner of Judges and Stewards of the International Arabian Horse Association (IAHA). It is unclear what his qualifications were for that job; nonetheless it was the longest employment he ever had, and his most prestigious. But Brown knew it was a singularly inappropriate qualification for the leadership of FEMA: FEMA’s official Brown biography, posted on its website, did not mention this job at all. It turns out that Brown had good reason to be quiet about this chapter of his life. When the new IAHA post was created, members were told that their leadership had sought a person with several key characteristics: competency, experience — and total independence from the cronyism of the horse world. In fact, what they got was the opposite. In retrospect, it looks like the fix was in for this position too. Brown’s job was to address concerns about the integrity of the horse-judging process. But the main thing Brown did was to pursue an “investigation” of the sport’s most successful trainer, a man who had angered powerful people with connections at the top of the Republican Party. The trainer, David Boggs, was accused of cosmetically altering the appearance of a horse, a serious violation of competition rules. Brown ordered Boggs banned from the show circuit for five years, a Draconian punishment tantamount to putting the trainer out of business. Boggs’s competitors were delighted. Boggs (who did not respond to interview requests) was, by most accounts, a talented and dedicated trainer. But according to Hart and others, he was hated by several Arabian Horse owners — who also happened to be very large Republican donors, including the late Bob Magness, a founder of the TCI cable giant; David Murdock, the Dole food company billionaire; and the late Alec Courtelis, a Florida developer. Courtelis had been one of George H.W. Bush’s major fundraisers, and the elder Bush was a frequent overnight guest at Courtelis’s horse farm during his presidency. This was a very, very close relationship. It is impossible to overstate the significance of George H.W. “Poppy” Bush’s taking a strong interest in helping this prominent backer. (As readers of my book Family of Secrets will know, the elder Bush had a well-concealed involvement with CIA covert operations throughout his life, long before his brief stint as a “civilian” CIA director — and long after.) Poppy Bush’s ability to make things happen and make certain problems disappear must be considered as one ponders how and why Michael Brown was moved into IAHA and proceeded to demolish Courtelis’s foe. In any case, Hart and other IAHA elders say they’re not sure whether Boggs was guilty, but since the horse in question became the preeminent sire of the breed, Hart thinks genetics may have been a more likely factor in its near-perfect profile than cosmetic surgery. In any case, Boggs filed a battery of lawsuits against both the association and Brown, the financial toll of which contributed to the association’s near-bankruptcy. There is no evidence that the big donors knew in advance about plans to hire Brown; Courtelis and Magness are deceased, and Murdock did not respond to an interview request. Yet, Brown’s performance clearly pleased influential sectors of the IAHA, as is apparent from the special treatment he was accorded. While other staffers had to report to work each day, Brown, on a full salary, was allowed to work from his sprawling, mountain-air home in Lyons, a distant suburb of Denver, the city in which IAHA was located. His lifestyle was so pleasant and relaxed that some in Lyons assumed him to be semi-retired. James Van Dyke, chef-owner at Lyons’ Gateway Café, says Brown had leisurely lunches at the restaurant almost daily. “He seemed to have a lot of time on his hands,” says Van Dyke. Brown’s single-minded pursuit of Boggs contrasted sharply with a pronounced reluctance to pursue another case that seemed to have considerable merit — one involving Murdock’s trainer, who was accused of filing false papers for a show horse. Ironically, it would be Murdock himself, in his zeal to help Brown, who would eventually sink him. One day, he mentioned to Hart that, at Brown’s request, he’d written him a $50,000 personal check, ostensibly for a legal defense fund to deal with Boggs’s suits. Hart was staggered to hear this, since the association was already paying Brown’s legal bills. But only a few months later, in February 2001, he resurfaced as general counsel, and later deputy director and chief operating officer, of the vast bureaucracy at FEMA. TOMORROW: In Part 2 of this series, we learn the hidden, real reason that Michael Brown, with no appropriate qualifications or experience, was brought into this important federal agency. We also discover shocking details of his past that should have disqualified him not only from running FEMA, but from any position of responsibility, period.